For over two years, the administration and teachers at the International School of Ouagadougou have been pushing to integrate Moodle into our curriculum and instruction. One reason for this was the impending 2015 election, which has been forecast for some time as a potentially unstable moment for the country. 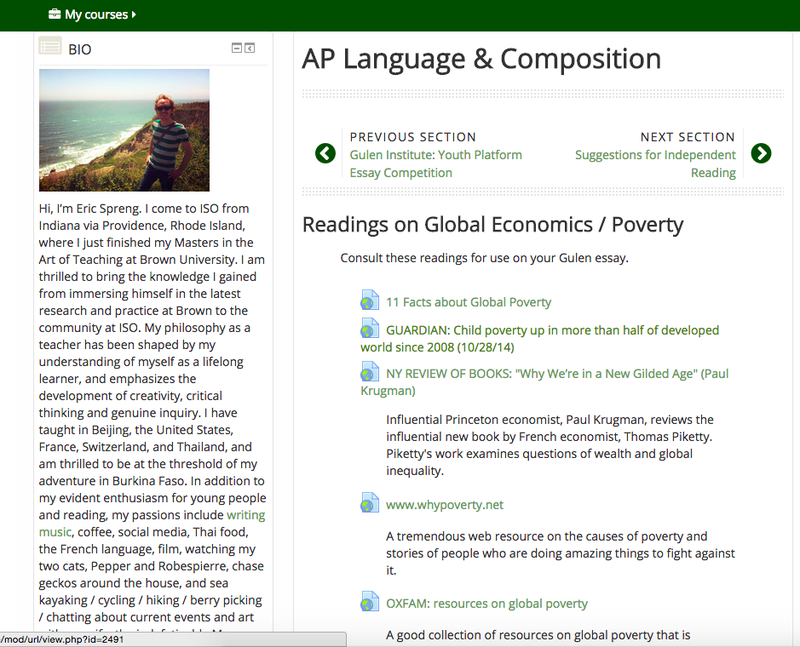 As a teacher at ISO who had not previously used Moodle, I was keen to learn the platform and to explore innovative ways to integrate it into my high school English classes. This I did, from my very first day at ISO, initially using Moodle as a resource hub and as a place to turn in major writing assignments. By the time school actually went virtual, as a result of political protests and a popular uprising, my students were well-acquainted with the interface. Admittedly, I was only scratching the surface of what a virtual platform can do. I believe this was largely due to the aesthetics of Moodle, which are surprisingly bad. Visiting the site feels like jumping through a magical portal to the web circa 1999. At virtually every level of design, beyond the unappealing typeface and convoluted sidebars, the site is abhorrent. Ultimately, design (shapes?) frames the user experience. But Moodle is what we had. So there we were. The success that I saw during our school closing, I believe, relates directly to the “No opt-out” policy that I had been diligent to uphold for the prior 15 months. This policy pertains to both the Moodle portal and students’ school gmail, which is seamlessly integrated with Google Classroom and fairly well integrated with Moodle. All formal written papers are turned in via the TurnItIn module in Moodle. I make no exceptions when students email to ask, which they inevitably do at the beginning of the year. In conducting school virtually, I have found teacher-student communication to be key to a successful learning experience. 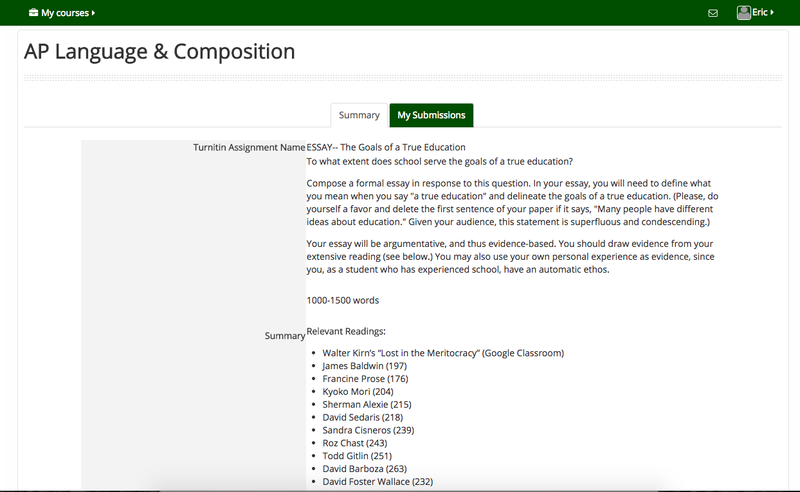 Given the messy design of Moodle, students can easily miss important assignments and deadlines. I have found the Quickmail module in Moodle to be a reliable way to communicate with the whole class through their school gmail accounts. I used Quickmail as a sort of tour guide to the (often frustrating) user experience of Moodle. Other teachers at our school set up a reflection journal which parents and students were able to use as a way of maintaining a proactive feedback loop between teacher, students, and parents. If the learning experience is going to be meaningful, assessment must be authentic. Assessment for summative as well as formative purposes must be integrated into the virtual school experience. Designing summative assessments, at least in the high school English classroom, is a more obvious task than designing formative assessments. 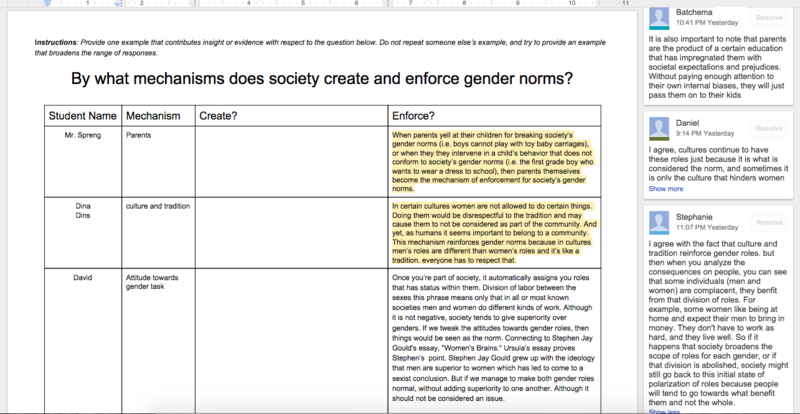 Nonetheless, just as I would do in the classroom, I analyzed student work in order to understand how my students were demonstrating their emerging understandings with an eye to address misconceptions quickly and effectively. I created screencasts in response to this formative data. The problem of low bandwidth, which is endemic to Burkina Faso, posed a challenge. However, I found it possible to create and upload a low-resolution video to youtube reasonable quickly, without monopolizing the bandwidth that I had to share with colleagues. I made use of formative assessment data in short, “direct instruction” screencasts. It was important to me that students, who were essentially cooped up in their houses for a number of days due to the political unrest, still had a chance to work collaboratively, as they would in my classroom. For this, I turned to Google Docs. I made four copies of the document and then shared each with six different students. (This all takes just a few minutes’ work in Google docs.) The platform provided a virtual learning space somewhat akin to the tables where students sit and work together in class. Now, students had the opportunity to engage with their peers’ thoughts. 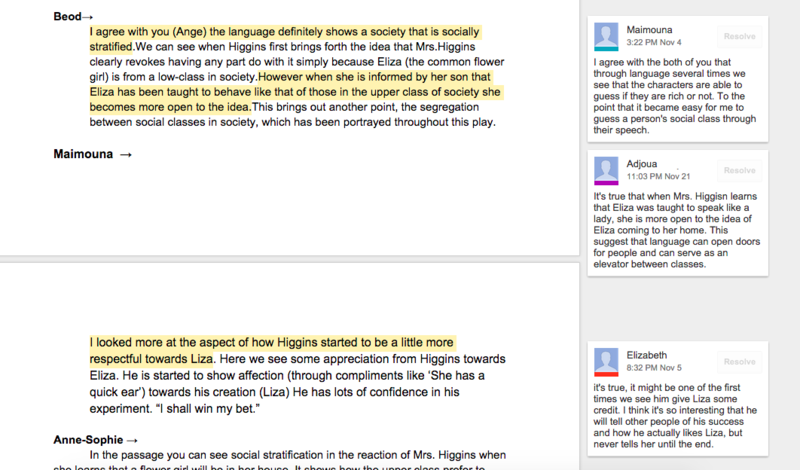 While I also experimented with using Moodle’s forum module, TodaysMeet, and even Twitter to generate engagement, I found the collaboration via Google Docs to be the most effective. Our virtual school experiment only lasted for seven school days, thankfully, before stability returned to the capital city and we resumed our normal class schedules. Still, as a faculty, we learned a lot, and the experience has helped us to become better equipped to create meaningful online learning experiences in the future, should the need arise. 1. Talk to your colleagues. Our experience at ISO was of dynamic professionals coming up with creative solutions to common problems. While we did have one teacher who taught virtually through a political coup d’état elsewhere, and another who conducted classes online as a result of the SARS scare, we were all essentially in the same boat. This willingness to collaborate is what made the experience such meaningful professional development. 2. Design lessons with student experience always in mind. 3. Specify how long students should spend on a given task. This is crucial. Otherwise, you will find your perfectionists spending two hours on a writing assignment you intended them to spend ten minutes on! Likewise, it is difficult to use a piece of writing for assessment purposes without setting a time limit, as you are introducing another variable. The functionality for setting time limits for assignments in Moodle works reasonably well. 4. Empower students to use the resources available to them. High school students do not need to email you for EVERYTHING. Many of our teachers found themselves completely overwhelmed in emails from students asking clarifying questions. Many of these emails were redundant. By communicating clear instructions and expectations up front, you can save yourself from being buried in emails later. One way I addressed this problem with my high school students was setting up a crowd-sourced tech support page via Google Docs. I instructed students to first check there if they were having some sort of technical issue with Moodle / Google Docs / Gmail / Twitter / TodaysMeet / etc. 5. Be proactive with struggling students. They can get buried quickly. A little work up front on your part can prevent a lot of heartache later. 6. When classes resume, be sure to create engaging lessons that are only possible in a face-to-face classroom. In my classroom, this meant a “Lemons and Limes” mixer, community building and sharing, arts literacy (drama, spoken word, performance), and other active learning. Your students will likely be as happy as you to resume learning in the classroom! High school English teacher by profession & vocation. Committed writer, traveler, maker of music.